I'm a busy gal, particularly on weekday mornings. I usually start my day with an early workout at the gym, then I dive head first into rush hour traffic which seems to just get busier and busier by the day (thanks, PA construction! ), so I don't really have time to enjoy a leisurely sit-down breakfast before work. For the past few months, I have been experimenting with a breakfast smoothie I could sip in my car during my morning commute. My goal: A smoothie that's tasty, healthy, filling, and gives me just the boost I need in the morning. Simple enough, eh? Well, I did a lot of recipe tweaking. In the process, I made smoothies that were too thick, not thick enough, too bland, too filling, not filling enough...you get the idea. I started out with strawberries, bananas, milk, and tofu, played around with the relative proportions of each ingredient, and eventually added grapes for its tart sweetness, flax seed meal for its fullness factor, tea for the caffeine boost, and stevia to sweeten the tea-infused drink without adding any calories or causing my blood sugar to go out of whack. Note: If you have a standard size blender or food processor, it may be necessary to split the ingredients in half and complete the procedure twice. 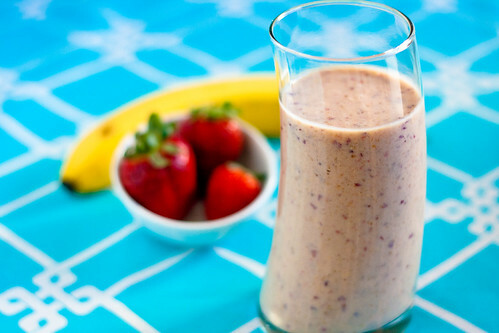 Blend ingredients together in a blender or food processor. Enjoy! I prefer to freeze fresh fruits when they are sufficiently ripe and then use them later when I need them to make smoothies, and this eliminates the need for added ice that might dilute the flavor. However, it is certainly feasible to use the unfrozen version of the fruits and just add a bit of ice to make it cold. In the fall I sometimes substitute 1 cup of apple cider for the grapes. I have also occasionally substituted ground nut for the flax seed meal with great results. I also make a version of this for lunch or as an afternoon snack that uses twice the amount of milk, which adds 30 calories and 3 grams of protein per serving, and omitting the tea as well as the stevia (without the tea, I find it unnecessary to add the sweetener). It actually tastes better than the breakfast version with tea, in my opinion! And the full list of nutritional facts can be found here.